Text source: Copyright © GSCC. Used with permission. The term Koli means fisherman. According to legend the Koli claim to be descendents from the Black Dwarf that came forth from the body of King Vena. Numbering more than 12 million, they are one of the largest communities of western India. The Koli constitute of a number of communities with various occupations and cultural identities while still remaining Koli. As their name implies, fishing is common. Some are laborers, agriculturists, water carriers, boatmen and some raise animals. Some Koli have advanced education and have positioned themselves well within society and government, but the majority live within the lower strata of society. 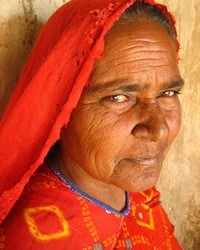 The Koli live mostly in the villages and towns of Gujarat and Uttar Pradesh. They live the simple life of agriculturalists. However, as technology has entered into the life of most people they are also aware of the life available in the city and have experienced a few of the material benefits that can be obtained. 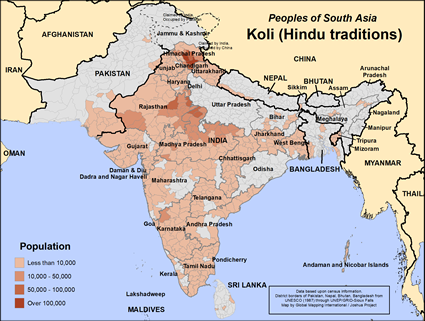 Nearly all of Koli are Hindu while a very few practice Islam. The eldest son inherits the father's authority. The Koli cremate their dead and practice death pollution for eleven days. The Koli worship Guar Mati and Holi Mata among other deities of Hinduism. They also believe in ghosts and spirits. Depending on the region, they will celebrate the Namiya festival associated with fishing as well as Karbha, Bahan and other common festivals. A Brahmin priest will officiate at religious activities as well as rituals associated with the cycles of life. * Ask God that workers will be sent to every district and village. * Pray that God will raise up Koli evangelists that will have a heart to reach their own. * Pray that God will send film teams that will present the life and death of Jesus. * Pray that the God who has set eternity in their hearts will prepare their hearts for the Gospel.View Koli (Hindu traditions) in all countries.